Back in spring, the Easter Bunny brought your family a little, furry gift. Now that gift has grown to be quite a bit larger, and your kids have grown quite attached. While keeping a bunny outdoors in the spring and summer can be a great idea, providing lots of fresh air and distance from the “mess” that they tend to make, keeping a rabbit outdoors in the late fall and winter season in Southeastern Massachusetts can have disastrous consequences. The freezing temperatures, snow, wind, and ice of this region can make it difficult to keep a rabbit outdoors year-round successfully. The good news is that bunnies can be litter box trained very similar to cats. 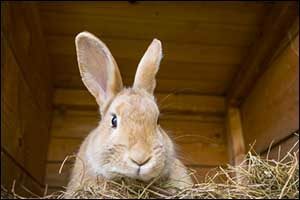 This process, as well as other seasonal pet tips and your local South Coast veterinarian, can help you successfully take care of your rabbit indoors without your home smelling like a barn at the local fairgrounds. Litter box training tips and a good veterinary check-up with your trusted veterinarian in South Coast can alleviate any worries or fears that you might have about bringing the family pet indoors for the fall and winter seasons. In fact, the benefits are so plentiful, you just might decide to keep him indoors year-round. Rabbits will naturally use just one or two places to urinate and defecate in their cages. If you have been in charge of hutch cleaning, you have probably already noticed this occurring. Litter box training tips typically involve putting the litter box right where the rabbit has already chosen to go inside the hutch. Once they start going in the desired spot, you can move that spot to another location, such as in a room indoors or an indoor hutch inside your heated and insulated garage or home. Some rabbit owners prefer to have “free range” bunnies that roam around like cats or dogs, as long as the litter box training has been successful. Otherwise, you’ll spend all day cleaning up little round pellets and searching for “that smell” in corners around your home. It is important to place the litter box in a place where the rabbit will feel safe. Bunnies are notoriously skittish, so if they do not feel comfortable, they will go someplace else that makes them feel more secure. Consider litter boxes that include an enclosure or place the box somewhere in the hutch or your home that makes them feel safe. You cannot use the most popular and widely used brands of “kitty litter” from the pet store for your rabbit’s litter box. Look for organic brands that are made from oats, alfalfa, or paper products. Most rabbits will spend a lot of time in their litter box and may even nibble a bit on the substrate, so it is important that you don’t use anything that contains ingredients that might harm them. No pine, no cedar shavings, and no wheat. You can simply use hay as a litter substrate, but your best bet is to speak with your South Coast veterinarian when you go in for your veterinary check-up or to ask about litter box training tips. While most people will tell you that training is best when your rabbit is very young, the truth is that rabbits of all ages can be litter box trained. In fact, older rabbits are easier to train than babies. If you have had a rabbit for a couple of years and wanted to try litter box training, you should give it a go. If you are having any issues, consult with your veterinarian in South Coast to ensure that there aren’t any health problems that may be causing delays. Spaying and neutering can also make a big difference. You should have them spayed or neutered before their hormones become active between the ages of 4-6 months. Again, consult with your veterinarian to make sure this is done at the appropriate age. Litter boxes should be cleaned out regularly to encourage your rabbit to keep using them. The best choice is natural white vinegar, which can help get out even the toughest stains and smells. It can even be used to clean up accidents that happen outside of the hutch, cage, or sleeping area. It is a good idea to have an indoor hutch or cage if you are away from home for any length of time. Make sure your rabbit’s litter box can fit inside the enclosure while still providing enough room to move around, eat, drink, and sleep. Don’t expect litter box training tips to take effect the first time you try them. Be patient, bunnies can take a lot of time to learn something new, but once they do, they remember it for a lifetime. If you have any questions about litter box training tips, seasonal pet tips for bunnies, or if you want to schedule a veterinary check-up, just give us a call at 508-996-3731. Our team of highly trained and experienced veterinary staff can help you find the best solutions, treatments, and options for all of your pet questions and problems. Call today to schedule an appointment with our veterinarian in South Coast at Anchor Animal Hospital in Dartmouth, Massachusetts.